First, a little bit about my Aunt Eva. She was born on January 13, 1924, the first child of my paternal grandparents, John Nusbaum Cohen, Sr. and Eva Schoenthal. My father was born almost three years later. They were very close as children growing up together. 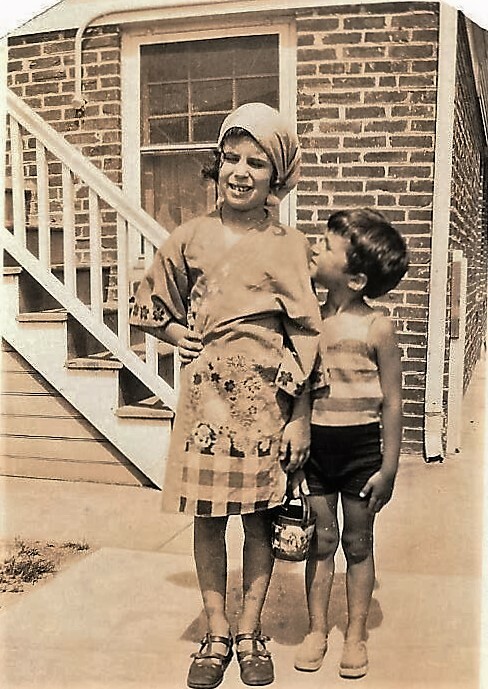 Eva and John Cohen, Jr.
My father describes his sister as a strong-willed and rebellious child who became a strong-willed and rebellious teenager and adult. She also was a very intelligent woman with many interests. She graduated from Gratz High School in Philadelphia in 1941, where she apparently was known by the nickname “Ave,” and was described as follows in the yearbook: “To Gratz our “Ave” has given services of hours; in almost every field she has displayed her powers.” From the list of her activities, that inscription seems accurate: drama club, debate club, a cappella choir, and several others. Simon Gratz High School yearbook 1941 Ancestry.com. 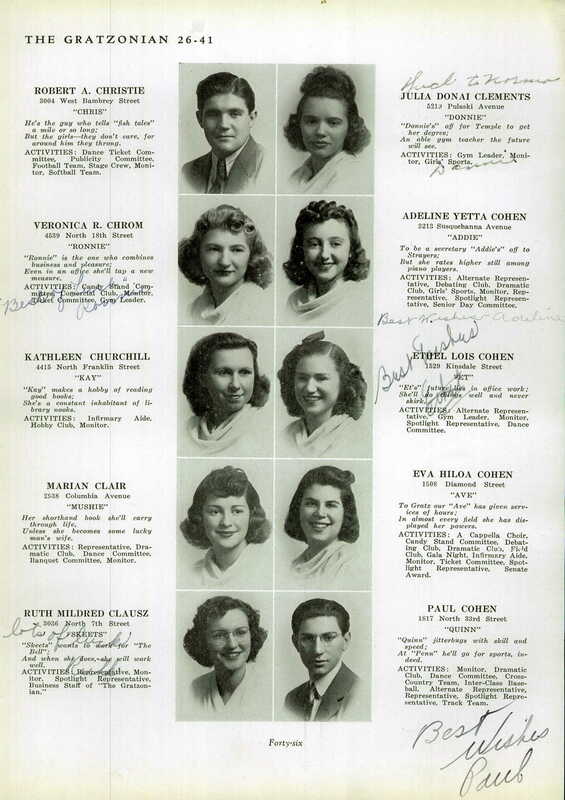 U.S., School Yearbooks, 1880-2012 [database on-line]. Provo, UT, USA: Ancestry.com Operations, Inc., 2010. During World War II, she served in the United States Navy. She served from February 10, 1944 until February 10, 1946, and was stationed in Corpus Christi, Texas, for most of her second year of service. She wrote a letter to her mother in May, 1945, describing her trip by train from Philadelphia to Texas. I had to chuckle as I read it because it sounded so much like her, describing and naming every person that she met along the way. She clearly was a hit with the servicemen, frequently being invited to eat and drink and sit with them on that long train. That ability to befriend new people wherever she went was a skill she maintained throughout her life. After the war, she completed her education at the University of Colorado at Boulder. There she also was active socially and academically. 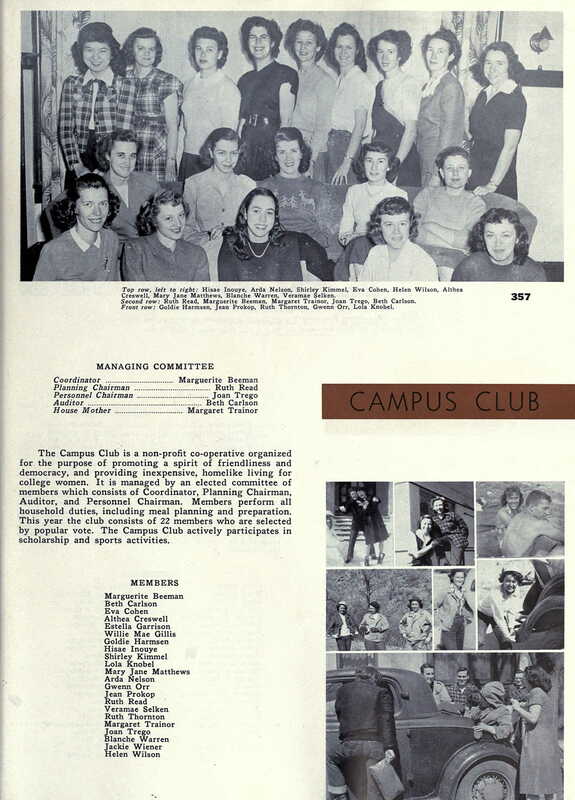 University of Colorado at Boulder yearbook 1949 Ancestry.com. U.S., School Yearbooks, 1880-2012 [database on-line]. Provo, UT, USA: Ancestry.com Operations, Inc., 2010. After college she became engaged to be married to a man named Karl, but when she was diagnosed with multiple sclerosis, Karl broke it off, not wanting to care for someone he thought would be an invalid. He sorely underestimated her. She never married, but her inner strength and her independence held in her good stead for the rest of her life even as her physical challenges became greater. 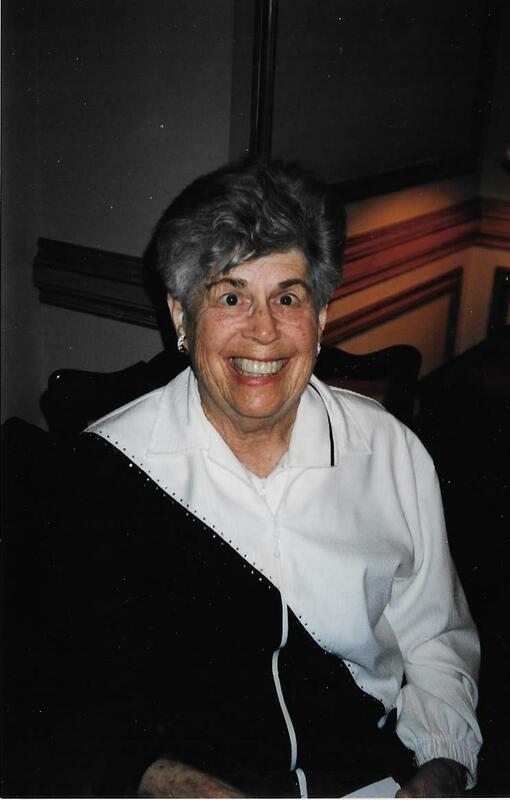 She worked for the city of Philadelphia until retirement age, and she had a large circle of friends who were devoted to her. She traveled all over the world and was interested in many things and well-informed about current events. She remained devoted to my father, and he to her, her whole life. 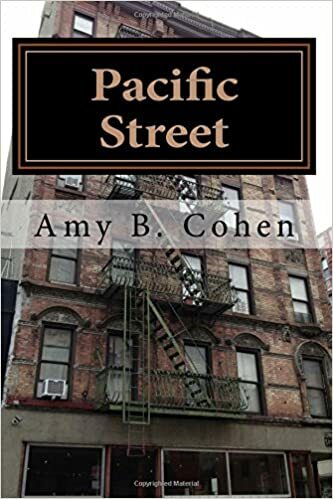 Her collected photographs and letters reflected those priorities— the many letters she kept that she had received from my father over the years; lots of photographs of our family, extended and immediate; lots of pictures from her numerous trips and cruises. And many, many pictures of people who were her friends. The photographs were not at all organized by subject matter or date, so as I went through the photographs with my brother, I sorted them into piles—family, travel, friends. I wasn’t particularly interested in the last two categories, but I still looked at each photo, hoping to find some of my ancestors or distant cousins mixed in. Then I found this photograph. It was a Christmas card with a family photograph, an item for the friends’ pile. But I looked at it more closely and thought one of the faces looked familiar. Then I looked at the family’s surname, and I got the chills. The face was in fact familiar. 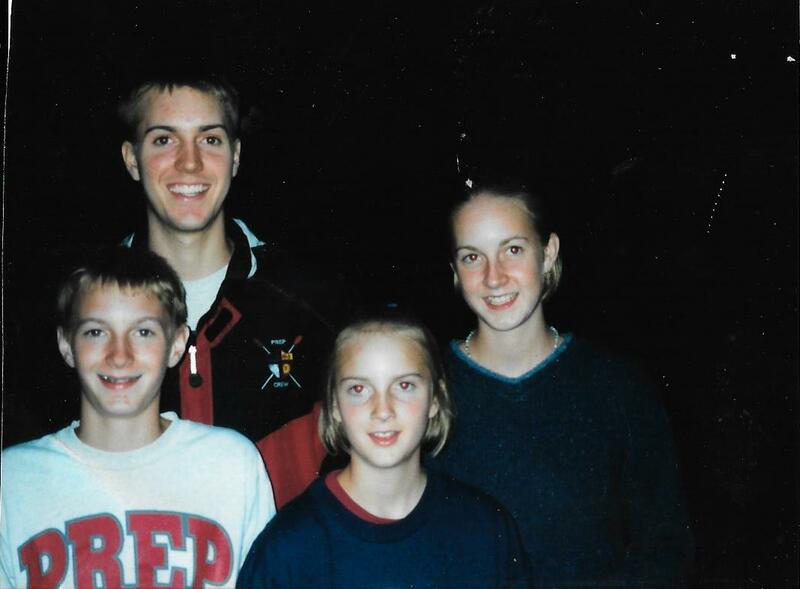 The little boy in that photograph looked just like the young man who is now engaged to my daughter’s best friend Anna. I knew that her fiancé Mark was from Philadelphia, and it certainly was possible that my aunt could have known his family. But nevertheless—what were the odds? Mark’s parents are at least a generation younger than my aunt. How in the world would they have known her? It made no sense. 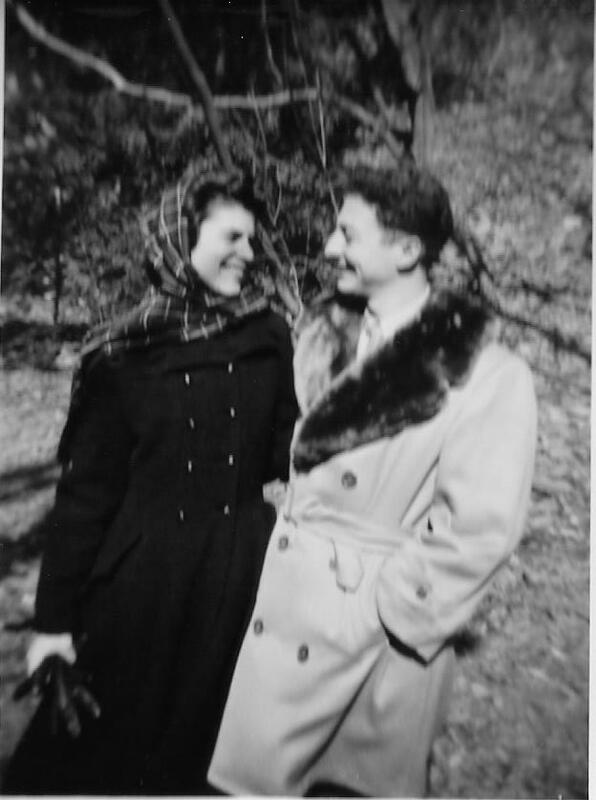 I continued looking through the photographs, and I found five more pictures of Mark’s family, including his parents’ wedding photograph. Obviously, my aunt knew his family for a long, long time. I took snapshots of the pictures of Mark’s family with my phone and sent them to Maddy and Anna, asking them if this was Mark’s family. Anna responded that indeed it was his family. Anna asked Mark what he knew about my aunt, if anything, and he did remember her and said that his father had been a lifeguard at the pool in her building and had met her there. That made perfect sense to me. 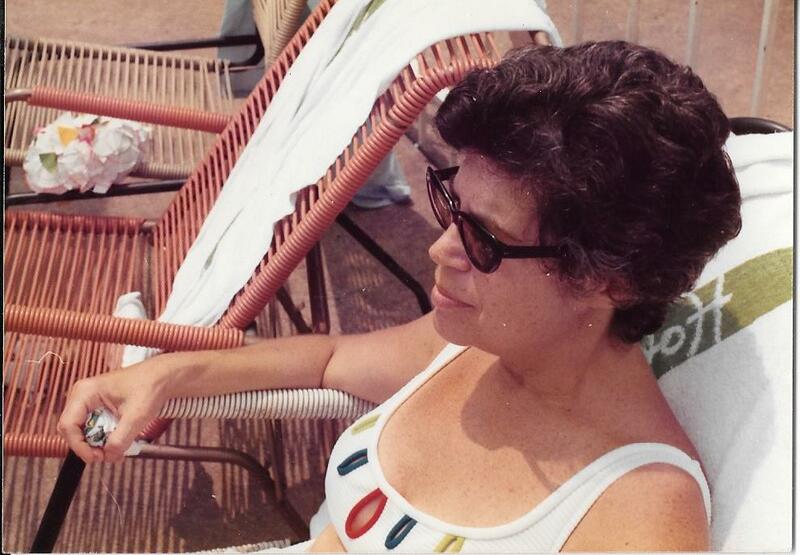 My aunt was an avid swimmer; being in the water gave her the mobility and comfort that she could not find out of the water because of her MS. As my father wrote in one of his letters to her, she swam in pools and oceans all over the world; she found it liberating. When she moved into The Philadelphian, one of the large apartment buildings in Philadelphia, one of the great benefits was that there was a pool in the building. It was there that she made many friends over the years, including Mark’s father and his family. I still get the chills thinking about this. There I was sitting in my parents’ house, sorting through photographs mostly of strangers, and I found a photograph of someone who will now be marrying Anna. Anna, whom I’ve known since she was born and who has been my daughter Maddy’s best friend since they sat in the sandbox as one year olds at our child care cooperative in 1985. Anna, who was Maddy’s roommate in Boston for several years—until she met Mark. Mark, a delightful young man whom we met the first time a few years back when he was helping Maddy and Anna move from one apartment to another and sitting patiently outside the apartment, watching their stuff while they went to rent a truck. Mark, whose father befriended my aunt years before Mark was even born and who obviously stayed in touch with her over the years as his children grew to adulthood. I am sure that my aunt would have been thrilled to know that her friend’s son was marrying her great-niece’s best friend. I am just sorry she is no longer around to hear the story. It’s the kind of story she would have loved. This entry was posted in Cohen, Favorite Posts, Pennsylvania, Philadelphia, Photos and tagged multiple sclerosis, Philadelphia, University of Colorado at Boulder, US Navy, World War II by Amy. Bookmark the permalink. I know. I am still shaking my head in wonder! Such an amazing coincidence! You do resemble her– I even see you in her baby picture! I have a picture of me at that age—quite similar! So do I! It just shows how we all are related interconnected in one way or another. Aunt Eva does, indeed, sound like she was a strong, independent woman. A terrific salute to her memory and it is a very small world! Thank you, Linda! She really was. I didn’t appreciate that as a child, but as an adult I’ve realized just how remarkable she was. What a wonderful story of your beautiful (inside and out) Aunt Eva! How amazing the orbit of connection, and sorting those photos. I do feel that we are so lucky when we receive these old pictures, and each picture has a story to tell. Thanks! Thank you, Maryann. Isn’t it amazing how we really all are just six degrees of separation from each other? And I do love old photos. Most of the ones in this post were in fact from those suitcases! Your aunt sounds like an utterly amazing woman. I can’t help feel that the man who jilted her probably did her a terrible favour. He just doesn’t seem worthy of her! I love the serendipity of finding the connection between your aunt’s friend and daughter’s friends fiancee. Beautiful. I think you’re right, Su—he probably would not have made her happy. I think she was someone who treasured her freedom too much to be tied down and likely would have felt suffocated by him. Or at least I like to think she was happier living her life the way she did, although she certainly would have preferred not having any physical challenges. Yes, MS was a cruel blow to someone who seems to have had such energy and talent. But adversity can bring out the best in people, and I guess it definitely did so in your aunt’s case. 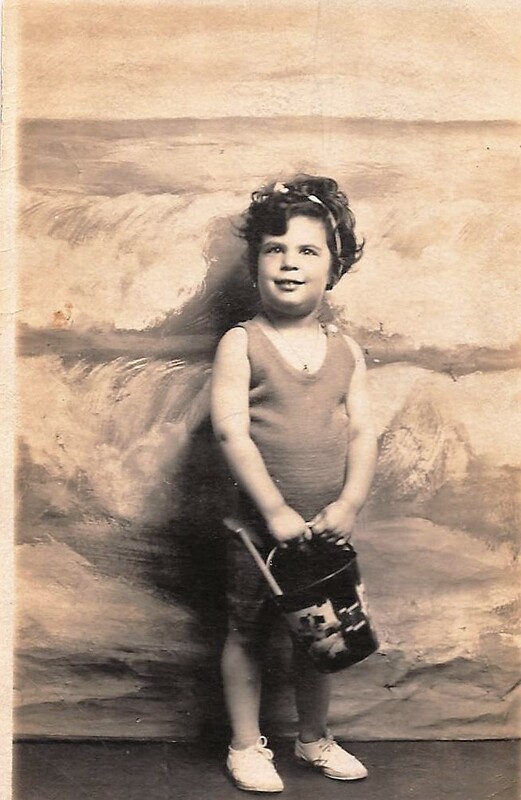 I so loved the photo of her toddler self in her bathing costume, posed against a studio painting of the ocean. Priceless! I loved that one also—it’s one of the treasures I found in that suitcase! Jeffrey and I were always in awe over Eva strength and accomplishments. Knowing her through our visits, she was always entertaining with her stories of schooling, travel and especially her friends. Her sense of humor was amazing and she was truly an individual whom we admired. Thanks, Joann. You should know that among those photographs were a number of your kids as well as one of you, Jeff, and Eva at your wedding. Obviously you and Jeff and Zach and Jessie were very important to her. She was lucky to have you in her life. Thanks! Does this mean you are on this side of the Atlantic? What an amazing story. Poor old Karl was a fool to let her go! Thank you for always being there. I love you. What a touching story. I’m familiar with the Philadelphian apartments, and both my children went through the Gratz College post-bar mitzvah program. Small world indeed. And it just keeps getting smaller! Thanks for reading, Ruth! Wow! Meant to be. What an amazingly wonderful find. That’s what I said to Anna—meant to be! Thanks, Leslie. Hope all is well with you. For once, the power of the photograph is proven. Wonderful story!